Red pandas live in the Eastern Himalayas in places like China, Nepal, and Bhutan. Around the world 50% of all red panda’s habitats have been lost, there are now less than 10,000 individual red pandas left. Red pandas are expected to decline 10% by 2048 if no action happens. Red pandas are often killed when they get caught in traps meant for other animals. They are also illegally hunted for their valuable fur and distinctive tails. Hunters use these to make warm clothing and accessories and sell them to earn cash. Red pandas like the artificial sweetener aspartame. This type of sugar is also found in products that humans consume. When hunters are hunting for red pandas, this is one of the ways they lure them into a trap. To take action, we are setting up an arts and crafts stall from Monday 14 May to Friday 18 May during primary lunch (12.50-1.20pm) for the students to have some fun and help us raise awareness about the red pandas. 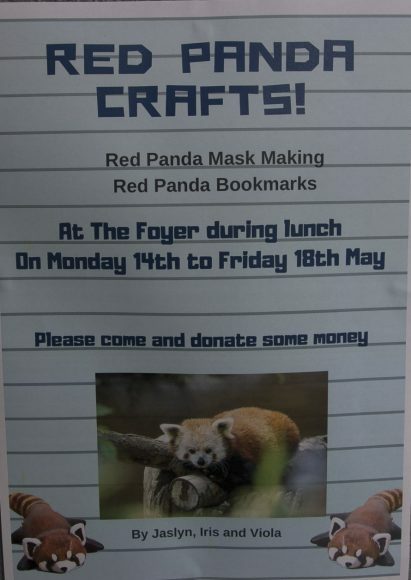 Anyone that comes can also donate so we can help save or protect the red pandas, the money will go to the World Wildlife Fund (WWF). There is also a lot more ways to save red pandas, some other ways are by adopting them, raising awareness or telling your family and friends that they are endangered.